How to leverage scorecard in business? To effectively use scorecards in our business, we could look at how it works in other areas of our life. As you know, scorecard is a simple tool for measuring performance and giving feedback. For example, a school progress report shows performance against maximum marks; it also shows trends. It provides student, teacher and parent an overall idea about the performance and it prompts them to take any corrective action. Take the case of scorecard for a game. It excites and energizes the players as well as the audience. Let us explore some of the attributes of a scorecard that can bring certain powers to you. The Power of Focus: As you know, focus gives intensity. A 40W bulb is just sufficient to illuminate a small room, but when the beam is focused, it can illuminate objects several hundred meters away. If you have taken a ride in ECR road from Chennai in night, you would have experienced this: you can see the road illuminated kilometers in front of you, reflecting the beam of your car headlamp. Something similar happens with scorecard when we measure performance against the goal that is important to us. We may do hundreds of activities, but scorecard brings focus to a few critical measures and keeps our mind focused on the targets and the critical things to do. We are aware of the 80/20 rule or the Pareto principle. By this rule you will find that 20% of your activities will account for 80% of your results. By having key action items (or strategic initiatives) against your goals, the scorecard can help you to get focused on those ‘vital few’ activities that will account for most of your results. The Power of Leverage: When you leverage, you give a small input and generate a large force or output; for example with the fulcrum of a lever, you can magnify the force. Or with a small signal input at the base of a transistor, you can control a large power flow. You would have found that when you give feedback to your team with a measure or scorecard as a basis, your influence is far more than otherwise. The Power of Alignment: Several interesting phenomenon we can observe, when things are aligned. When ions are aligned, we get superconductivity and it can produce extraordinarily strong magnetic field. When light waves are ‘aligned’, we get Laser. Think of the magnificent opera, where several artists play their role in alignment; or a symphony orchestra, where thousands of musicians play their instruments in harmony. Another example is the Olympic opening/closing ceremonies where the participants perform in unison. 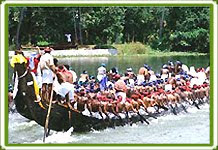 A popular event in Kerala is ‘Snake Boat Race’. It is amazing to watch the rhythm, the coordinated hand movements of about hundred oarsmen and the synchronized chanting of singers. Great excitement is generated when people align to a common goal (video of a boat race). “He whose ranks are united in purpose will be victorious.” – Sun Tzu, ancient military strategist. Scorecard when reviewed by all stakeholders has a huge influence on team/business alignment. The Power of a Written Goal: There is something magical about writing things down. It has been found that people commit themselves to their goals when it is recorded. Scorecard is a place where you have your goals in writing. The Power of Feedback: Our perceptions can sometimes be biased by recent events and decisions based on perceptions can go wrong. Scorecard showing trends eliminates this bias and can give new insights that can lead to better decisions. The Power of Dashboards: We know what a dashboard means to a car or a cockpit to a plane. I am sure you will not embark on a long journey in a car that is not having a dashboard. Once you automate your business scorecard and incorporate the features of dashboards such as status, alerts, drill downs, you get a powerful environment to manage your business. The Power of Filtering: One problem that happened with business process automation or ERP implementation is that there are hundreds of reports available to track. We are bombarded with mountains of information every day, thanks to the advancement in technology and communication. However, our natural capacity to process info remains more or less the same. So we need effective filtering mechanisms for the information deluge. Scorecard/dashboard can act as a great tool that can filter info and alert you for taking action. By understanding the attributes of a scorecard we will be able to leverage it better in our business. Scorecard is a simple and powerful tool that you can use to provide feedback, to focus, to align, to leverage, to communicate, to motivate, to inspire, to manage, to improve, to engage and to ensure certainty of success in business. The Balanced Scorecard (BSC) concept was created by Doctors Robert Kaplan and David Norton in 1992, and has been implemented by thousands of corporations, non-profit organizations, and government agencies worldwide. The Balanced Scorecard is a framework that describes and measures the strategy of an organization across four perspectives: financial, customer, internal processes and learning and growth. It has grown from a measurement system (that reports on past operating performance and the drivers of future performance) to powerful communication tool and to transformative strategic management system. Vision: A concise statement that defines the mid- to long-term (three to ten year) goals of the organization. The vision should be external and market-oriented and should express how the organization wants to be perceived by the world. Mission: A concise internally focussed statement of the reason for the organization’s existence, the basic purpose toward which its activities are directed, and the values that guide employee’s activities. The mission should also describe how the organization expects to compete and deliver value to the customers. Strategy: Strategy is about selecting the set of activities in which organization will excel to create a sustainable difference in the market place. The sustainable difference can be to deliver greater value to the customers than competitors, or to provide comparable value but at lower cost than competitors. Financial: To succeed financially, how should we appear to our shareholders? Customer: To achieve our vision, how should we appear to our customers? Internal Business Process: To satisfy our shareholders and customers, what business processes must we excel at? Learning and Growth: To achieve our vision, how will we sustain our ability to change and improve? 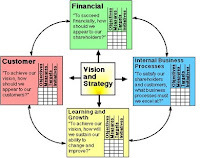 Key Objectives: At the center of the Balanced Scorecard framework is “vision” and “strategy.” The articulated vision and strategy are translated in to performance objectives and measures that can be tracked and used for the successful implementation of vision and strategy. We will arrive at strategic objectives under each of the perspectives by asking several questions and brain-storming. For example, under Customer perspective, we may ask questions such as “Who are our target customers?”, “What is our value proposition in serving them?”. Measures: Key Performance Indicators (KPIs) are identified for each strategic objective. 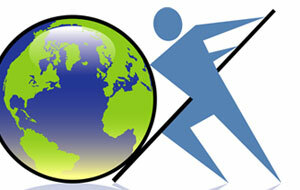 KPI is a measure of performance and measures progress toward organizational long-term goals. A Balanced Scorecard will contain a mix of KPIs and its associated lead indicators (also called performance drivers). These measures are not isolated; every measure selected should be an element in a chain of cause-and-effect relationships that communicates the strategy to the organization. Targets: Targets for the measures identified. These are normally stretch targets that will allow breakthrough performance. Initiatives: These are strategic initiatives identified to close the gap between the targets set and the current performance. Strategy Map: A one-page graphical representation of what you must do well to execute your strategy. It is done in a plain and simple manner that is easily understood by every employee from top to bottom. It is a powerful communication tool to convey to all stakeholders what the organization is attempting to accomplish in a simple, coherent package (sample). Scorecard/Dashboard: Scorecard gives performance measurement against targets and the measures are developed using a methodology such as Balanced Scorecard. Dashboard is normally an IT application that displays process measures and is rich in visual displays. A general dashboard need not display measures always against a target. It can have drill downs to analytical reports. There are several applications such as the one from Corporater that can be used to implement Balanced Scorecard System (a sample dashboard screen-shot from Corporater). What makes the Balanced Scorecard so powerful? Let us explore this next week. For more info on the Balanced Scorecard, refer Resources in CXO Dashboards. For regular updates on business performance measurement, please subscribe CXO Insights. 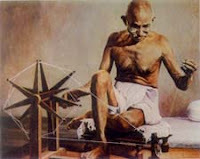 Gandhi used the ‘Charkha’ to achieve self-sufficiency for millions of Indians and to align/focus them on the key goals during the Freedom Struggle. Obama and his Federal CIO Vivek Kundra are transforming the way the US Govt works, starting with ‘Federal IT Dashboards’. What tools do you use for transforming your business? Today, several top organizations use performance measurement based tools such as Balanced Scorecard and Business Dashboards for transforming their business. Translate your vision into reality by tracking your strategy in measurable terms. Provide dashboards for your key people to start with, and see the productivity revolution unfolding. You might be interested in 10 Questions to a Balanced Scorecard Expert: Answers by MG Thomas in Balanced Scorecard Designer. For getting weekly tips/insights on performance measurements and improvements, by email, subscribe to CXO Insights. Some business owners say they have been running the organization without any dashboard and yet successful. Some think they have to spend additional time to update the scorecard. Some others perceive dashboard as a costly tool. Some organizations tried, but still struggling to meaningfully measure what is important. In early 90’s, when the ISO 9000 wave started hitting the Indian IT industry, the same issues were there and Project Managers were managing their projects without a proper project plan. Project Planning and Tracking process was very ad-hoc and the success of projects often depended on the heroism of the project managers. I was managing a team of 50 at that time, yet couldn’t get an MS Project, because it was not popular and it was costly. Today, a typical C-Level Executive (CXO) manages several strategic initiatives that are critical for the organization to create and maintain their competitive edge. They may continue to use tools such as project plans, status reports, budgets to manage their operations. With these tools, they could get swamped in flood of data and operational issues; they may lose focus on their strategic priorities. We expect every project manager to have a project plan. Similarly, Scorecard/Dashboard is a tool that every CXO must have. In fact every role in the organization should have an associated dashboard that has some metrics corresponding to their key goals. My belief is that, 5 years from now, if a CXO doesn’t have a dashboard, he will be out of the game! Period. Do you know that CXO Dashboards can help you to arrive at scorecards/dashboards for every critical role in your organization? To get weekly tips on Performance Measurement, Balanced Scorecard and Business Dashboards, subscribe to CXO Insights.